From small leaks and DIY disasters to furniture repairs and full property maintenance - Fantastic Handyman will handle it all with diligence. We'll send a multi-skilled repairman to your place so you save the time and money you’ll waste on looking and paying for a separate electrician or plumber. Save yourself the stress of looking for different tradesmen to handle your property maintenance. Fantastic Handyman has the experienced and skilled pros in one place. Do-it-yourself projects sound great on paper but don’t always look or work great. 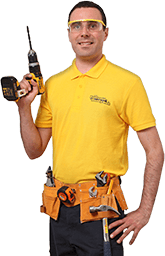 You can save yourself the time and anxiety of trying to fix it - your Fantastic Handyman is just a few clicks away. Each expert is equipped with a range of manual and power tools to handle anything from broken furniture, and leaky taps, to scratched wallpaper and replacement of fixtures. Combined with the years of experience, and skills, your handyman can tackle any repair job and offer you some useful advice as well. In case your job requires any extra parts or materials, we can find, purchase, and supply them. Keep in mind these count as additional costs. You can also rely on us for the more advanced jobs such as rewiring or lighting faults repair. These jobs are handled by an experienced electrician. Your home is in safe hands as the professionals we send are careful and diligent. Also, they carry public liability insurance so nothing can go wrong. Sometimes you might need immediate help from an expert. No need to dial a phone, you can just make an appointment in no time by using our online booking form or the GoFantastic App. Also, with the mobile application you can book other services for your place such as cleaning, gardening, removals, pest control, and many more!